This classic Bench/Vanity Stool is made out of wood, solid wood, solid mahogany, and upholstery, and is in good condition. GREYHOUND : THE CHEAPEST AND FASTEST UP TO 100 LBS. CMS TRANSPORTATION INC.
Vintage Vanity Bench Stool Queen Anne Style Carved Legs Solid Wood Free ship! Solid wood and very sturdy. CONDITION REPORT – Traditional style / Clean pre-owned condition- Small mark on the top. This is to ensure all around efficiency, as we prefer to have the piece(s) located, prepped, & ready prior to your scheduled arrival. CONDITION REPORT : Clean Pre-Owned Condition. 3-6 weeks. A photo record is made and kept when the item first arrives to our facility before being stowed away & listed for sale. We do like to point out any issues in the photos with a pen and/or list any issues there may be, as listed above in our. Solid and Firm. Words used such as Original, or reproduction, or the style of, or made by. And including a variety of reason. Los Angeles Area (Santa Ana, CA 92705). Otherwise, Wear is usual for its age. AGE/COUNTRY OF ORIGIN : Approx. CONDITION REPORT : Clean Pre-Owned Condition. Small chip in front, and light scratching on back. STYLE: Traditional. Fabulous Pair of Wood and Upholstered Benches Ottomans/ Stools. Great looking set of ottomans / hassocks / footstools that are both stylish and functional. Will great with Hollywood Regency, French Provincial, Glam, Mid Century Modern MCM, boho, boudoir, neoclassical interiors. ~ MArked, George W. Archer: Pat'd 1873. High quality heavy cast iron swivel height stool. AGE / ORIGIN 3-6 weeks. NOT included in the price. This will ensure all-around efficiency, as we prefer to have the piece(s) located, prepped, & ready prior to your scheduled arrival. This is a small stool . Would be perfect as a photo prop! High quality genuine leather upholstered ottoman, with solid wood turned feet. ~ Reddish/brown colored leather. A photo record is made and kept when the item first arrives to our facility before being stowed away & listed for sale. Heavily worn, the unfinished pine is gorgeous with old oxidization and traces of paint that warm up the room as only a rough antique surface can. WORN PINE ANTIQUE HALL BENCH. Loss to front left toe. Guy Chaddock & Co. Hartford Pair Leather Seat Swivel Bar Stools. This size is perfect for placing at the foot of a king size bed. Can also be paired with a dining table for maximum seating. Windsor / Traditional. AGE / ORIGIN A photo record is made and kept when the item first arrives to our facility before being stowed away & listed for sale. We do like to point out any issues in the photos with a pen and/or list any issues there may be, as listed above in our. 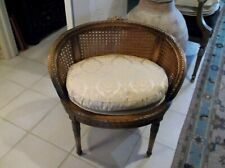 Really Nice Condition with Only Very Minor Wear to the Wicker. Undated, circa early 1800s or earlier. Sturdy piece. Clean, simple design. Square nails. A beautiful primitive mission arts & craft style old bench from the earlier settlers of Lancaster County, Amish or Pennsylvania Dutch. CONDITION REPORT : Clean Pre-Owned Condition. STYLE: Traditional. Martins Chair Inc. Backless Pair Black Counter Stools. CONDITION REPORT : Clean Pre-Owned Condition. CONDITION REPORT : Clean Pre-Owned Condition. Light Stains to Uphl. This wonderful Bench has unusual colorful legs on the sides that are made out of resin, see pictures, and the legs have interesting curved designs. This gorgeous Vanity Bench has fabric on the seat and it is very long and comfortable. Each piece having striped white and blue cushions. 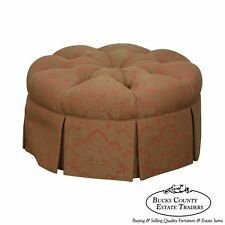 Ottoman H: 16.5" x W" 27.25" x D: 17.5". CONDITION REPORT : Traditional style/Clean pre-owned condition. Indention on one of the stools. BEFORE purchasing. Bucks County Estate Traders has 3 different locations in town. This is to ensure all around efficiency, as we prefer to have the piece(s) located, prepped, and ready prior to your scheduled arrival. Also enhancing the overall look of this footstool are the four turned legs. Each leg is a sturdy hardwood stained a light color and tastefully distressed. The resulting look provides both elegance and sturdy support. A photo record is made and kept when the item first arrives to our location before being stowed away. We like to point out any issues in the photos with a pen, or list any problems there may be in our ‘CONDITION REPORT ’ above. Sheraton Style. Bench Was Refinished & Recovered - Retaining Original Cloth Biggs Label As Shown. Solid Mahogany. Traditional Style. Specifically, but without limitation, Stenella Antiques and Interiors makes no representation or warranty that any of the lots conform to any standard in respect of safety, pollution or hazardous material, or fit for any particular purpose. AGE/COUNTRY OF ORIGIN : Approx 50 years, England.